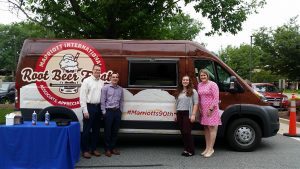 Washington DC, May 26th, 2017 – This week marks the 90th anniversary for Marriott International. Now the largest hotel chain in the world, it is hard to believe that it originated as an A&W Root Beer stand. In 1927 J. Willard Marriott founded that root beer stand which later grew into the Hot Shoppes Restaurant chain and evolved into today’s Marriott International hotel company. To commemorate 90 incredible years, Marriott International has partnered with Scoops2u for an unforgettable anniversary celebration. 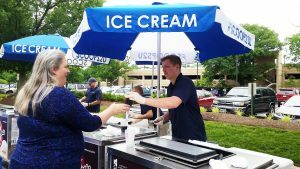 Scoops2u has custom wrapped an ice cream truck and carts with Marriott’s unique design and has been touring Marriott properties throughout the DC area this week. 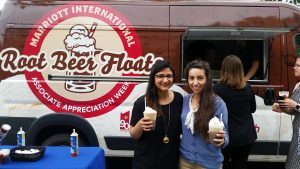 And the best part…they’re serving up free root beer floats made with premium homemade ice cream and none other than A&W Root Beer!